Lenovo-owned Motorola Mobility plans to continue building out its Moto Mods lineup. It is now gearing up to release several new ones for the Moto Z smartphones over the coming months. There’s no exact timeline for release known at present, but Motorola is definitely hiding something surprising up its sleeve. According to a source over at Reddit, the most interesting Moto Mod to ever be released will be part of this lineup. It’ll be a new camera mod (not similar to the Hasselblad Zoom) that will resemble a real-life DSLR and enable you to swap lenses on the fly. You’ll be free to use lenses from Sony, Nikon, Canon or any other maker you prefer. This Moto Mod, as per the Redditor, was shown off at a non-public event earlier this week. The Camera Mod is expected to carry its own image sensor and would not rely on the lens on the Moto Z device you’re using. You’ll also get a shutter button and possibly some physical adjustment knob to switch settings, similar to that on a DSLR or mirrorless camera. And if the camera Moto mod can truly perform well, then it would certainly come at a hefty price to match (read: compensate) the features. 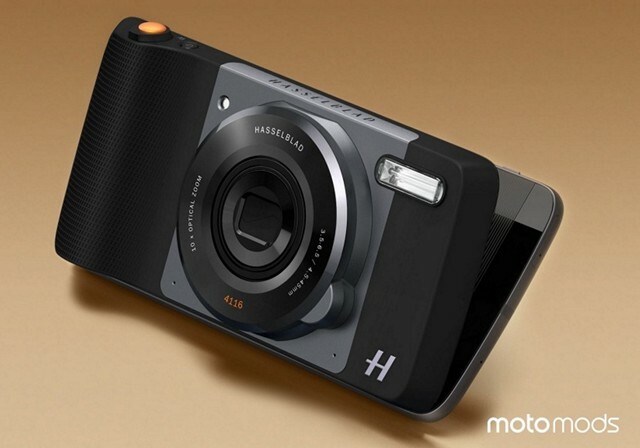 But, this is not the only interesting Moto Mod we expect to see the company launch this year. Another surprising concept for a Moto Mod has been shared by the source, where he says that you might be able to convert your phone into a quadcopter. Yes, drone Moto Mods are also said to be in the works. This mod would attach to the back of the Moto Z and give your device the ability to fly, take scenic photographs, and then again land back safely. The source suggested that this is a real Moto mod that would let your phone take flight for close to two hours, but the third-party maker of the same has backed out prior to the planned release. So, we’re not really sure if this will become a reality or not. In addition, the source suggests that the company will refresh some of its Moto Mods this year. We’ll witness the release of an upgraded projector Moto Mod, which is capable of offering 35% more brightness and a larger battery compared to the current mod. We can also expect to see a low-cost speaker make its debut at the Moto Z3 launch event, which has been leaked almost in its entirety earlier this year. So, are you excited for the launch of new Moto Mods? Or do you still think they are gimmicky? Let us know your views in the comments down below.